I love a good political drama, such as the new film The Debt, but I am not here to give you a review of that film. I am here to talk to you about the new book from Image comics called Pigs, by Nate Cosby and Ben McCool and the amazing artist Breno Temura. No, it is not the story of the three little pigs. It is the a story of a second-generation KGB Cuban sleeper cell who is here to overthrow the U.S. government. I know some people may look at this book as anti-American propaganda. But it is not – it is a very important part of history that is overlooked by storytellers, not just creators, and not just in comics, but in all mediums. Without giving away too many spoilers, this beautiful looking book takes place both in the past and in the future. We are introduced to a man named Vidlen on the streets of Cuba. The artwork by Temura reminds me a lot of one of my favorite comics from the past 5 years, Daytripper, by Fabio Moon and Gabriel Ba. We find out a bit about Vidlen’s family and their background. Like I said, without giving away too much of this first issue, I will just say the end was not something I saw coming. If you’re looking for a great political drama comic, then this is the book for you. And if you’re looking for a comic to give your non-comic friends, this is it. 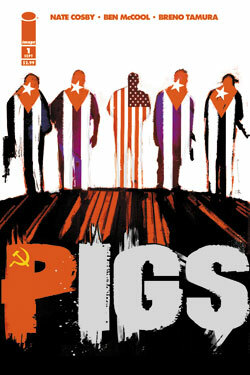 So make sure to check out Pigs from Image Comics, next week (September 14, 2011) at your local comic book shop. Join me as we wait for Pigs #2, because this is going to be an amazing series.